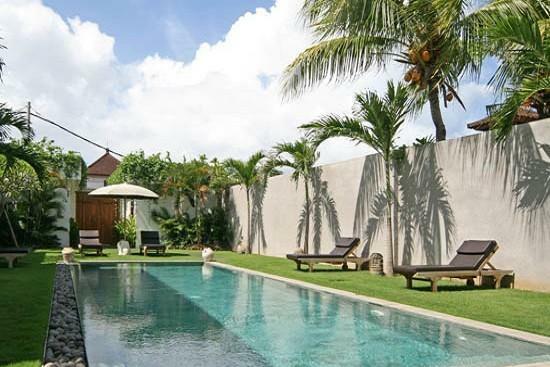 Villa 3167 is a spacious Bali rental villa, located 250 metres from the beach in the upmarket Seminyak area on Bali's southwest coast and accessed through the same road which serves the Club at the Legian Suites Hotel, and just minutes walk from the world famous Kudeta restaurant. 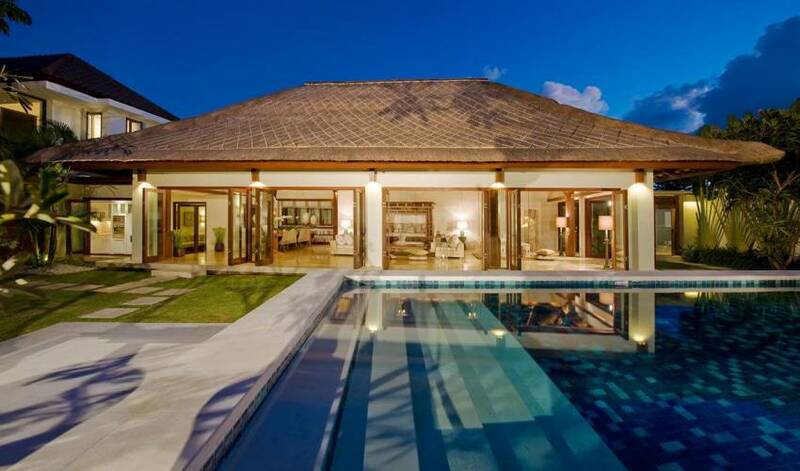 Positioned on a block of 1200m2 (just over a quarter of an acre), and fully refurbished in 2009, the contemporary Balinese architectural design featuring a blend of both modern and traditional elements presents a splendid villa boasting four bedrooms, and extensive living and dining areas. The wrap around balcony on the second floor and high ceilings found throughout the residence provides a colonial twist and the ultimate luxurious blend of space and style. 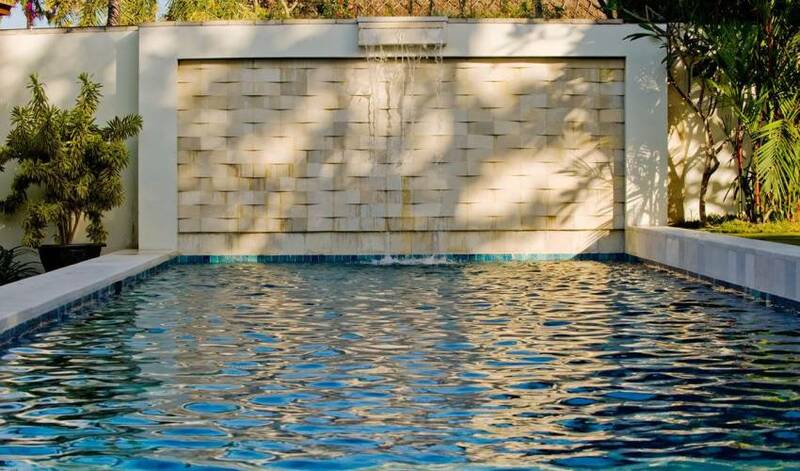 The sizeable gardens showcase a terraced lawn and a 14-metre swimming pool, together with a poolside 'bale' relaxation pavilion, presenting an ideal setting for weddings, parties and other special events. 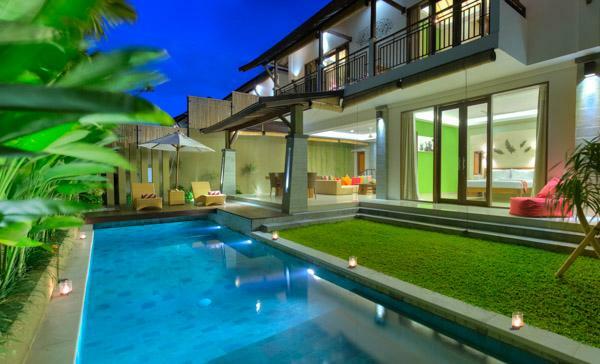 This inspiring Bali villa is a peaceful oasis in the heart of a trendy district. 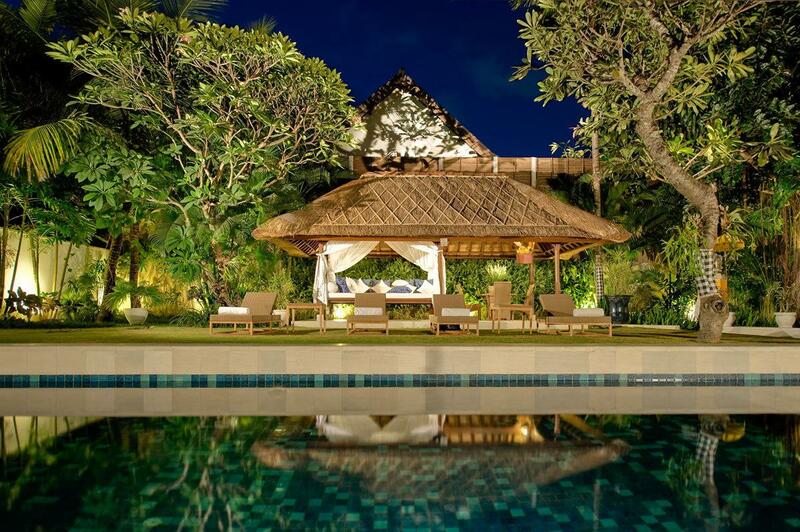 It is ideal for families and couples alike and has an extensive dedicated staff. 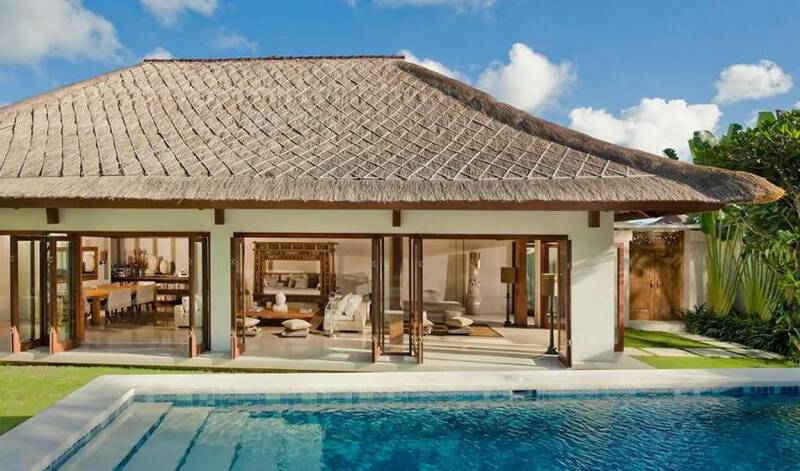 Accommodations at Villa 3167 comprise an expansive living & dining room, an air-conditioned media room, and four air-conditioned bedrooms complete with ensuite bathrooms. 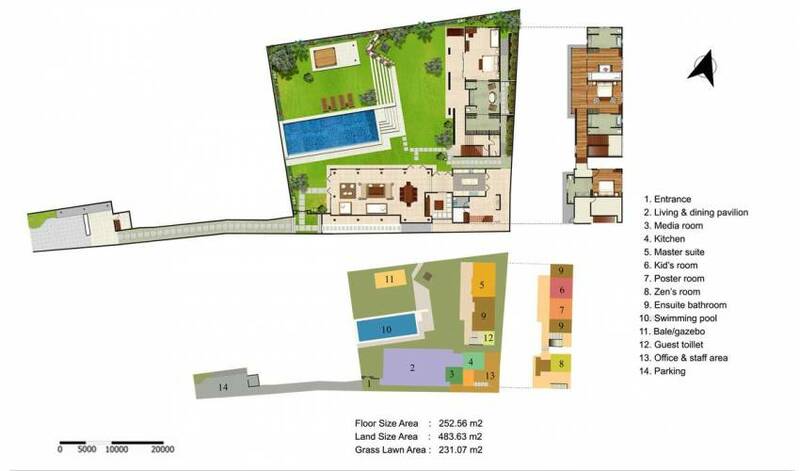 The bedrooms are situated in a two-storey building, which stands adjacent to the single storey pavilion that houses the living and dining areas. Each bedroom is equipped a satellite-channel TV and DVD player, and a safe deposit box, while WiFi Internet is accessible throughout the property. 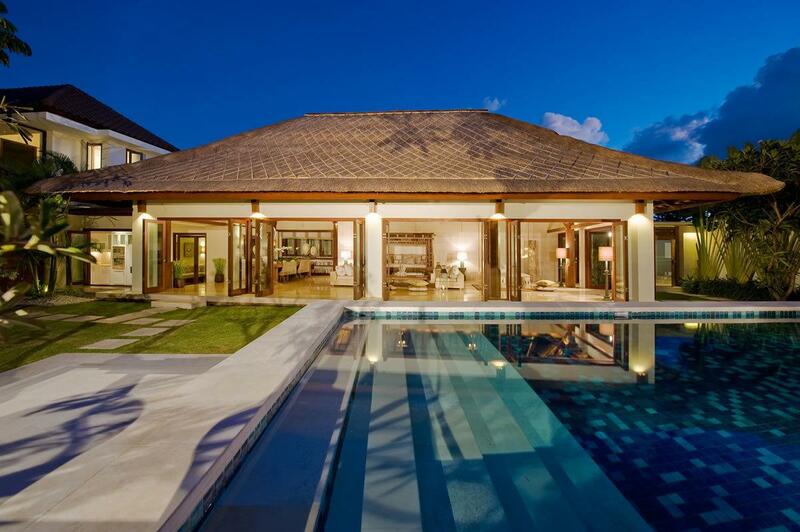 The expansive Living & Dining Pavilion is characterised by a soaring alang-alang (thatched) roof, cream terrazzo floor, and floor-to-ceiling glass doors that run the length of the building and along one side. 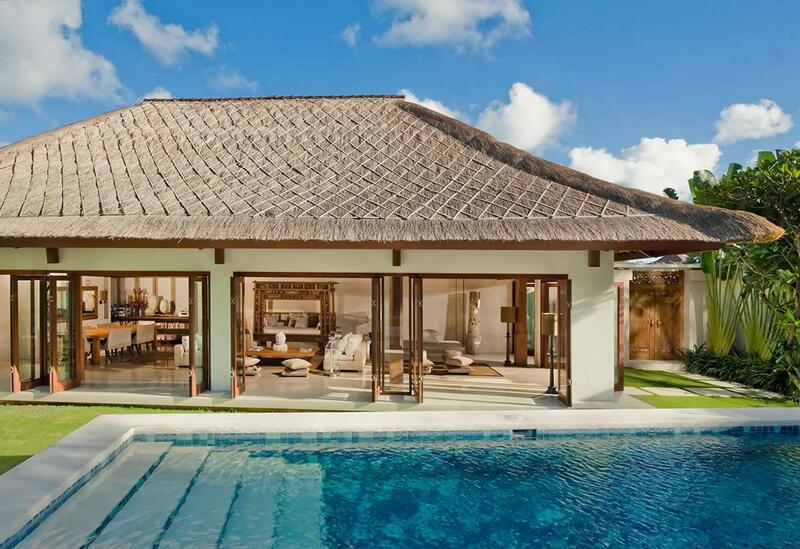 These doors offer the options of different environments, and can be folded open to create an open-air, tropical living experience beside the garden and swimming pool. The pavilion is cooled by six powerful ceiling fans and also features the option of air-conditioning. At one side of the room is a dining table, comfortably seating ten to twelve on funky double seats fashioned from cowhide. The centre of the living pavilion is furnished with two deeply cushioned sofas and an antique coffee table, and at the far side is a hammock-style swinging daybed suspended on chains from the roof. This elegant room is completed with an ornately carved Javanese daybed, gorgeous fabrics, glass and aluminium candle lanterns, stools and a carved Buddha head in petrified wood and further complimented by a high quality audio system and a good selection of books. The Master Suite encompasses the ground floor of the two-storey building. The suite is dominated by a king-size bed with a yielding padded headboard, while the wall behind displays a carved panel from a traditional house in Toraja, Sulawesi. In front of the bed is a pair of large wooden statues, depicting a Javanese wedding couple. Generously-sized, this bedroom also incorporates a sitting area furnished with a daybed and an antique desk. A 45” satellite-channel TV and DVD player rests on an antique ‘gerobok’ rice chest, juxtaposed with a window to one side that overlooks a small pebbled garden. Accessed via dramatic sliding doors, is the grand, ensuite, air-conditioned bathroom. It features an avocado-green terrazzo floor, a huge central bathtub, and two lazy chairs. A double vanity unit is fashioned in the same green terrazzo and presents two well-lit mirrors and twin washbasins. There is also a walk-in shower and a toilet hidden within an alcove. Floor-to-ceiling mirrored doors slide open to reveal a dressing room, fitted with a wall of white wardrobes. 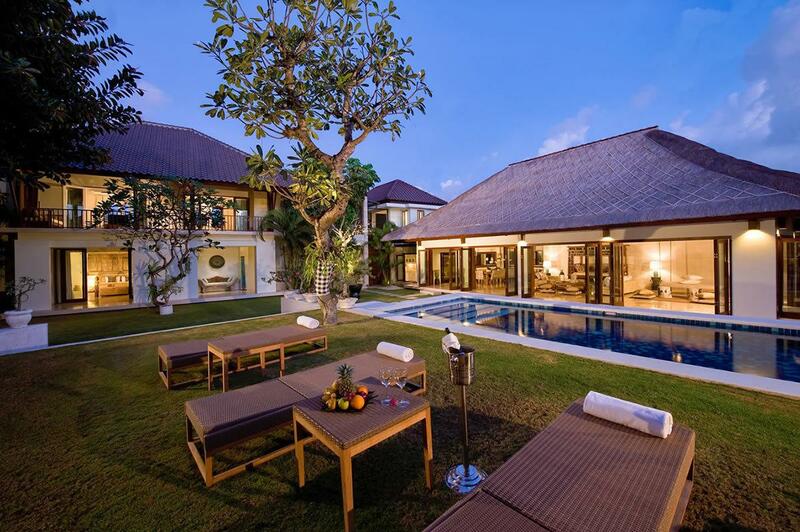 Sliding glass doors from the bedroom open onto a covered veranda that runs the length of the building and looks out over the garden and is complimented with a wooden Kartini sofa and a brass gong. The three air-conditioned guest bedrooms are located on the upper floor, accessed by a timber-clad staircase. Two of the rooms are bordered by a delightful covered balcony with a timber floor and elevated views of the garden. The balcony runs the length of the building and is furnished with a sofa, rattan chairs and a glass-topped table. The 'Poster Room' presents a fresh green and white colonial theme, with a romantic, king-size four poster bed, framed botanical prints on the walls and two white wicker planter chairs. The Kids' Room has a bunk bed where up to 5 kids can easily sleep. Thanks to an extension on a gorgeous featherbed, the room can be converted into a king size bedroom suitable for adult guests and couples. On the south side of the villa is the slightly smaller Zen Room, furnished with a queen size bed and its own ensuite bathroom with shower. All of these bedrooms are equipped with 30" flat screen TVs and DVD players. Two of the ensuite bathrooms are fitted with bathtubs, and all three have walk-in rain showers. 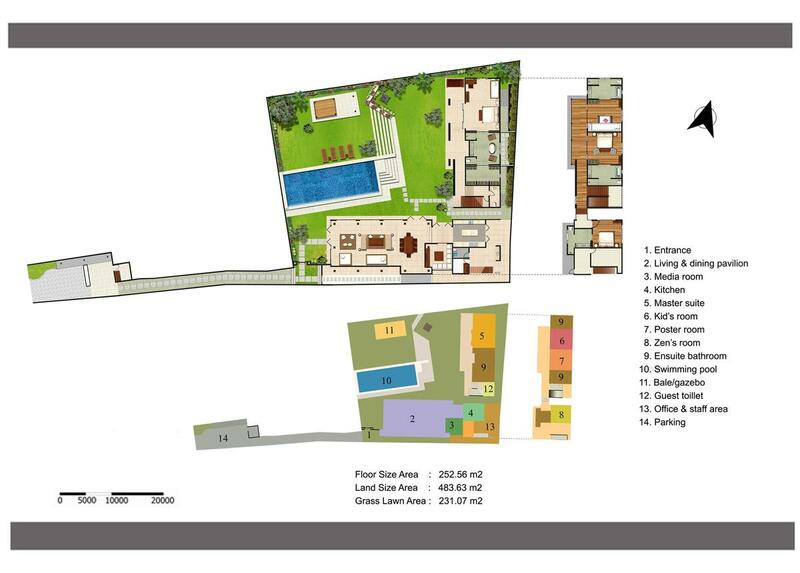 The Media Room is situated on the ground floor next to the living & dining area. This cosy, air-conditioned room is accessed by folding glass doors and features a cool terrazzo floor. A built-in L-shaped couch hugs the walls, creating a comfortable space for watching the 45" satellite-channel TV, complete with DVD/CD player and a good selection of DVDs. WiFi Internet access is available throughout the villa. WiFi Broadband internet connection (free of charge). 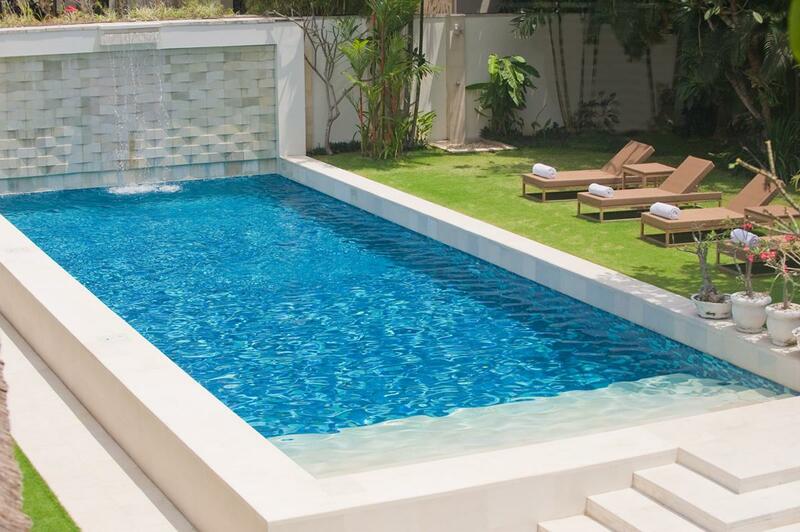 Villa 3167 is located in the very centre of what is now considered to be Seminyak's prime district, exemplified by internationally-acclaimed beachside restaurants, opulent spas, boutique hotels, trendy cocktail bars, and chic designer boutiques. 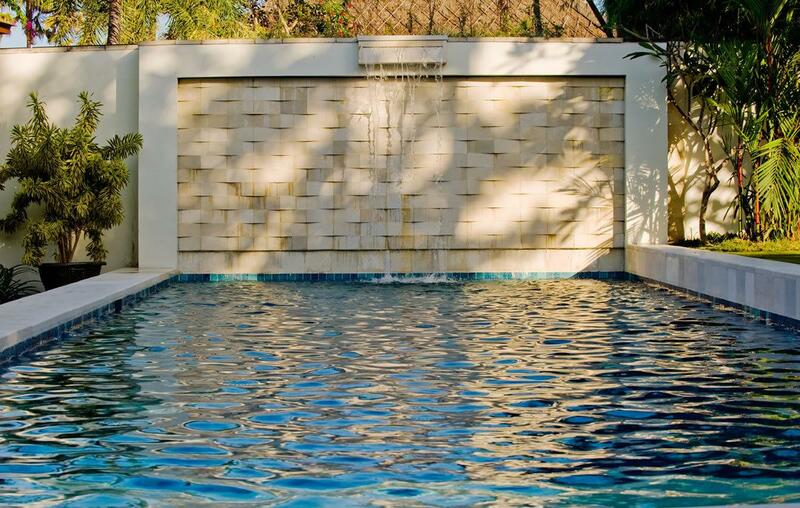 Within a few hundred metres, guests will find the well-known Oberoi and Legian Hotels, in addition to the famous Ku De Ta, La Lucciola, Nutmegs at Hu'u, and Breeze beachfront restaurant and bar at The Samaya among many others. Just footsteps away is the sweeping Seminyak Beach, renowned for its world-class surf breaks and panoramic coastline views; a playground of the rich and famous, this is the place where the local and expatriate communities gather every evening to enjoy the legendary sunsets. 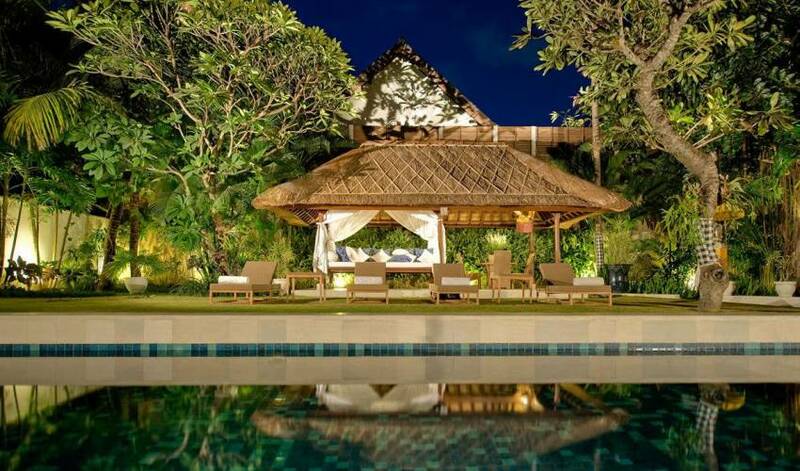 Nearby places of interest include one of Bali's most sacred Hindu temples, Pura Petitenget, the fourth largest temple in Bali, where some of the most spectacular Balinese ceremonies may often be witnessed. 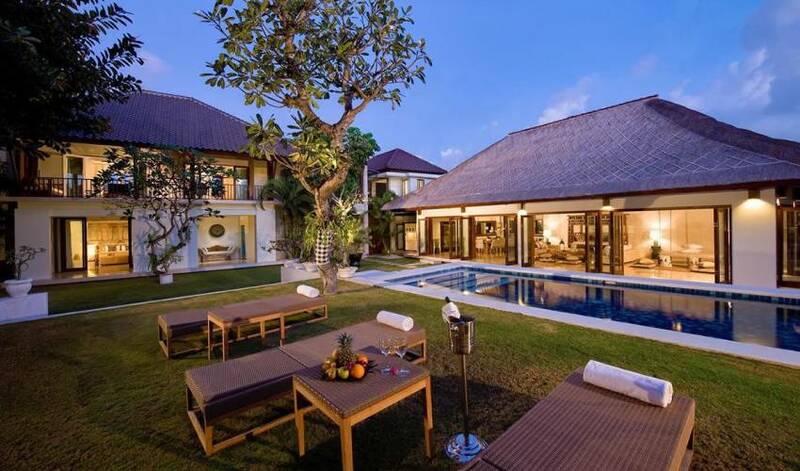 The villa is located 30 minutes from Bali's International Airport, and is convenient for to all of Bali's best shopping, top restaurants, and vibrant nightspots. 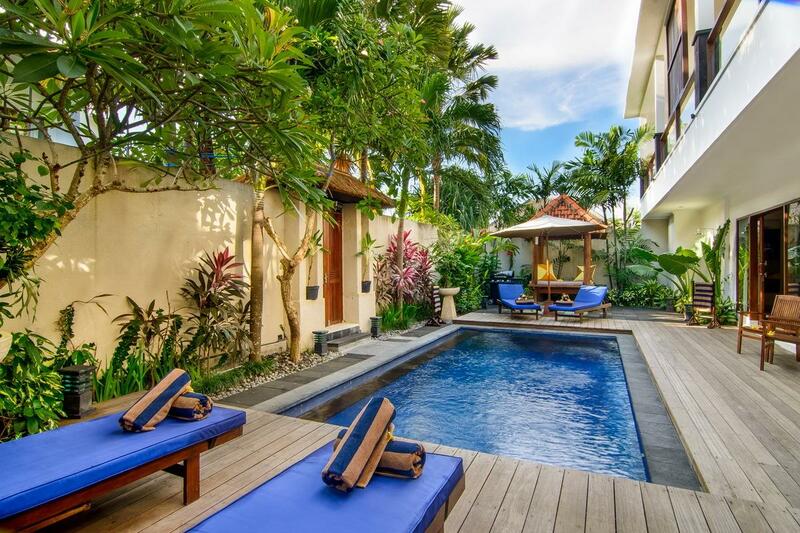 Just wanted to let you know that we had an absolutely fabulous stay at Villa 3167! Thank you for the recommendation!